Founded in late 2014, Luxepolis is today recognised as a game changer in the Indian luxury industry and playing a significant role in shaping the future of India's upscale lifestyle goods industry. Luxepolis is trusted by millions of high spenders in India and clocks higher average sales per order. Alexa, an Amazon digital traffic monitoring company, consistently ranks Luxepolis at the top of the traffic charts amongst all upscale fashion platforms in India. Luxepolis provides our customers a wide selection of authentic upscale products exceeding 47,000 new & certified pre-owned branded products, covering over 500 Indian and global luxury brands like Rolex, Louis Vuitton, Gucci, Dior, Chanel, Omega, Patek Philippe, Audemars Piguet, Michael Kors, Coach, Sabyasachi etc - the largest platform in India in its category. Brand New products are sourced from Luxepolis's trusted global sourcing and supply chain network of leading luxury fashion boutiques across the world. Supported by our proprietary database of upscale branded products, our authentication procedures and 200+ person years experienced global authentication team, we are able to ensure the authenticity and quality of every product offered on our platform. Luxepolis is the only company that provides Authenticity Certificate since the inception and has 100% track record of shipping only authentic products. We also partnered with major NBFCs and almost all major bank credit card companies to extend 5 year tenure EMIs on our product purchases. We partnered with critical shipment logistic companies to ensure our customers experience the best of our products and services. 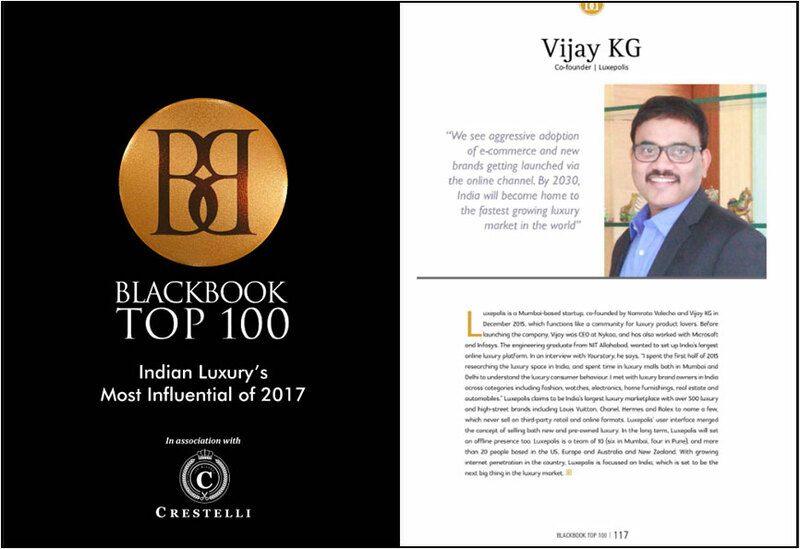 Our Founder, Mr. Vijay KG, has been named as Indian luxury's top-100 most influential by Blackbook. Luxepolis is proud to have been the only online luxury business featured in top-100 list. trusted online platform for upscale lifestyle products. Founded in Dec-14, with the vision of making luxury accessible and affordable, Luxépolis is conceptualized by a dedicated team of experienced professionals who believe that "luxury is timeless" and that every luxury piece, whether newly obtained or savoured for long, is a valuable investment. The founder comes with a deep experience of decoding consumer insights, taking luxury brands online and have successfully built and scaled e-commerce companies in the past.